Goddess. Queen of Wakanda. A leader of the X-men. Ororo Monroe also known as Storm. She is one of the most popular comic book characters and is one of my favorite women in comics. I know she has had a couple of mini series over the years, but Marvel should definitely think about giving Storm her own ongoing title. The old X-men arcade game from the 90’s introduced me to comics and Storm was one of the X-men characters that caught my eye. She quickly became not only one of my favorite X-men but also one of my favorite characters in comics period. A lot of people were introduced to her via the 90’s animated cartoon series that aired on Fox Kids and also X-men Evolution in the early 2000’s as well the most recent cartoon Wolverine and the X-men. So without further ado, let me tell you a little more about this amazing character. She is one of the most used X-Men. She has appeared in most of the comic books, all of the animated television series, nearly all of the video games, and of course all three live-action X-Men films-Halle Berry portrayed her. Chris Claremont, who followed up Wein as the writer of the flagship title Uncanny X-Men in 1975, embraced Storm and during his long run on Uncanny X-men, he wrote her as a strong character even when she had lost her powers she was able to defeat Cyclops and become leader of the X-men. Jim Lee who replaced Claremont in 1991 continued to write Storm as a strong character. In Uncanny X-Men #173, October 1983, Writer Claremont and artist Paul Smith created a new look, for Storm. She now wore black leather top and pants, and her white hair was styled into a punk Mohawk. 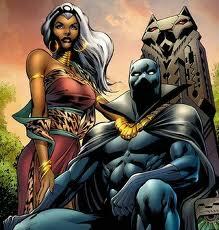 In 2006, Storm married the King of Wakanda T’Challa aka the Black Panther. Storm deals with claustrophobia but in recent years she’s been able to overcome it. She is one of the most powerful mutants. Storm’s mutant abilities are limited only by her willpower and the strength of her body. Some Sentinels have considered Storm an Omega-level mutant. Storm is an expert thief, and a skilled, cunning and gifted hand-to-hand fighter, trained by Achmed el-Gibar, Professor X, Wolverine and T’Challa, the Black Panther. Storm is an excellent marksman with handguns, and is proficient in the use of knives. Storm carries a set of lock-picks with which she has an extraordinary ability at picking locks. She also carries her ancestral ruby, which allows inter-dimensional transportation with the help of her lightning. 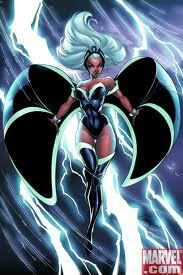 Her real name Ororo means “Beauty” in Storm’s tribal language. Many of her ancestors were sorceresses and priestesses and for some unknown reason, since the dawn of Atlantis, this line of African women has been given the distinguishing features of white hair, blue eyes, and powerful magic potential. Storm has been described as having one of the strongest wills among the X-Men, making her highly resistant to psychic attacks especially at the same time when she creates electrical fields around her. Telepaths have found it difficult to track her down and probe her thoughts. Storm was one of the first black comic book characters, and the first black female, to play either a major or supporting role in the big two comic book houses, Marvel Comics and DC Comics. Storm will always be one of the most important female comic book characters and she continues to make a lasting impact. Marvel, give her her own ongoing series, NOW! Issue #303: Trina Robbins Returns & DRAGONS!! !